Can anything make your heart sink faster than hearing a pathetic clicking when you try to start your car? Your battery’s dead again and, thanks to good old neighborhood unfriendliness, there’s no one around to give you a jump start. You don’t belong to an auto club, and none of your lazy friends will come give you a ride. Self-described crazy engineer Medhi Sadaghar of ElectroBoom shows us a rather unusual way to start a car with a dead battery using things that the average engineer (and a lot of other people) will have just lying around the house. 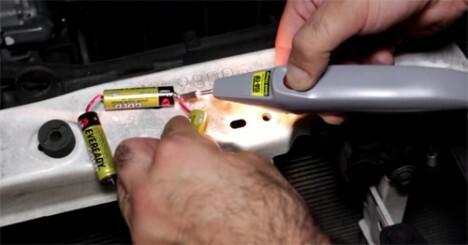 The video above gives an overview of using a series of AA batteries to give your car battery just enough juice for a single start. 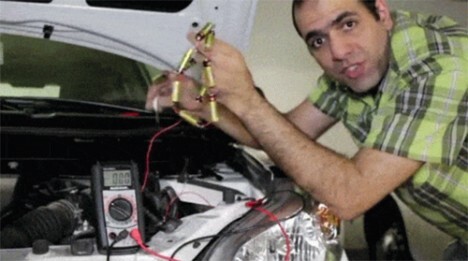 After soldering together a few AAs with wire, Sadaghar connects the batteries to the car battery – but be sure to connect positive to positive and negative to negative or your batteries will start smoking just like his. The setup basically pours the batteries’ juice into the car battery. It gives it just enough energy to turn over the engine one time. Tada! You’ve now got a running car and you didn’t even have to talk to any scary strangers in the process.